Putting an End to War. 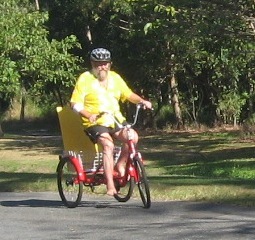 I’ve got a new red tricycle to tool around on in Cairns (on account of how the nasty old Queensland government has suspended my drivers license – because I’m refusing to obey a court order that I should give $400 cash money to the ALP). I love my new red tricycle! I’m keen to participate in nonviolent interventions that are nationally significant, so I’ve been thinking about two major actions in planning for 2011. 1/Transform ANZAC Day by adding a new event and liturgy. A lantern lit vigil at the Cenotaph from sunset on 24 April – in memory of ALL the victims of war. We pack up and leave when the RSL starts arriving for their dawn service. 2/Frustrate and stop the joint Aus/US wargames talisman sabre 2011 in June (32,000 troops, a nuclear aircraft carrier battle group, a well-resourced team of PR professionals, to practice invading foreign countries. Here you can find a detailed explanation about several bits of the puzzle, and how they might fit together. 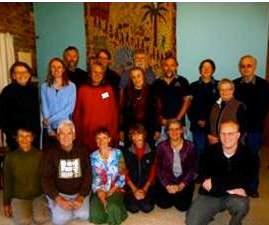 After the trial of the Waihopai Ploughshares (March 2010), I attended a national gathering of Christian (and Buddhist) nonviolence activists over the ANZAC Day weekend (April 2010). At the Australian Quaker Centre “Silver Wattle”, outside Canberra. E To seek opportunities for cooperative peace-making initiatives between Australian and New Zealand activists. Read the epistle at https://www.cairnspeacebypeace.org/?p=340#more-340 for its full flavour. It’s hard to describe the optimism with which folk addressed the tasks of transforming ANZAC Day and ending war. In the goals above, I’ve highlighted those elements I’m going to be active in. There is movement in each that I’d like you all to think about. 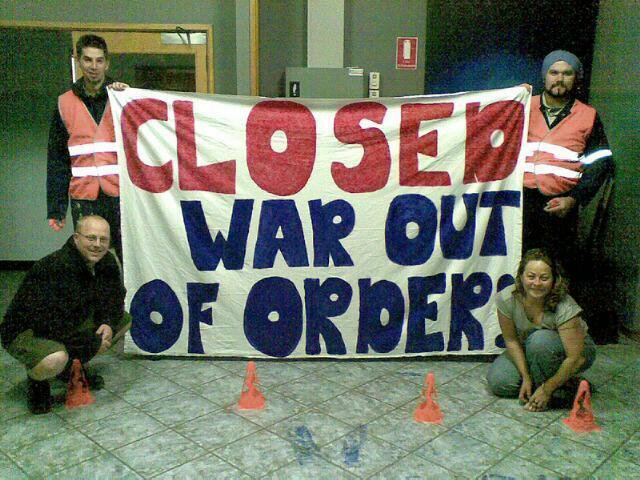 1/ PEACE CONVERGENCE Many individuals, groups, and affinity groups have already declared an interest in resisting the joint US/AUS military war-games TALISMAN SABRE (30,000 troops, a nuclear Aircraft carrier Battle Group and a professional PR apparatus, practicing to invade). The Peace Convergence is planning an event that builds on all that’s been learned at TS05, TS07, and TS09. Robin Taubenfeld is organising a Peace Convergence presence next month supporting the NAIDOC Day and Rally on June 11 in Rockhampton. Graham Dunstan will be there workshopping and making banners and lanterns with locals for the Parade and Showground. I’m going down for a week to support, to network, and to further survey the infrastructure of our military security state (around Rockhampton and Shoalwater Bay). I’ll share White Poppies. I’m also going to look around for a solution to my needs for a living and organising space for TS11. 2/ FAITH BASED NONVIOLENCE There has also been high levels of consent and commitment from Christian nonviolence activists for an interventionary program (which includes, but is not limited to, the conduct of a “Shoalwater Wilderness Pilgrimage”). Simon Moyle, Jessica Morrison, Simon Reeves and Jacob Bolton in Melbourne are extending the operation and scope of the Bonhoefer group, with an ongoing trespass intervention into the SAS training/intelligence base on Swan Island near Geelong. They have involved several Christian communities in Melbourne, and are escalating that action with a Court hearing and further direct action on Wednesday 16 April 2010. I’m going for that too. I’ll share White Poppies. Simon M and Jessica have expressed interest in extending their action leadership at TS11. Margaret Pestorius is pursuing engagement and commitment from senior spiritual counsellors to play a pastoral role for those who come to TS11 for Christian or Gandhian nonviolent action. Margaret will continue to think about liturgy and planning for the Wilderness Pilgrimage. David Johnson from Ravenshoe and Jenny Sterling from Townsville are considering. Everyone who comes to TS11 chooses their own level of commitment and risk. For example Moana Cole will be visiting from New Zealand and will confine herself to an educational role. Moana is a Catholic Worker, Mother and Barrister who has experience of Australian, New Zealand, and US Catholic Worker stories and dynamics. Moana spent 12 months in a US prison for taking part in the ANZAC Ploughshares in 1991, and will talk about what she’s learned over 22 years of action and reflection. 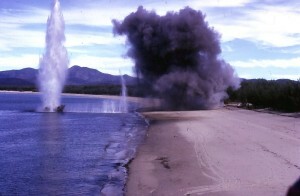 There will also be trespass actions designed to frustrate the military exercise, including the live-firing programmes. This will include an element of personal risk as affinity groups enter into the live-fire zones and publicise their presence. I want to trespass again. I want to re-form the Jagerstaetter 3 and make a shrine to him outside the base, and in. Maybe the Jagersaetter 4. Jim Dowling and Culley Palmer, are you listening? Plus there’ll be the veneration of saints and activists, worship in local churches. Quite lawful wilderness acclimatisation walks. And the full carnival of all the different creative peace-making that human beings are capable of. The Peace Convergence and maybe even a C2C festival from the Byfield community again. 3/ ANZAC DAY and TS11 In its war liturgy for ANZAC Day the RSL uses a single line 13 of John 15 by itself – “Greater love hath no man than this, that a man lay down his life for his friends”. They use this isolated phrase as excuse to pretend that being killed while trying to kill one’s enemy is a Christian thing to do. It is not, and never can be. Line 12 of that very passage reads “This is my commandment, that ye love one another, even as I have loved you.” Line 14 reads “Ye are my friends, if ye do the things which I command you”. Christ expects us love our enemies, and to love them so strongly one is prepared to lay down one’s own life by following Jesus’ commandments and trusting in God. That is what we must do to be Jesus’ friend. So one key point in our focus for ANZAC Day is to restore the full meaning of John 15 in public discourse on ANZAC Day. It is also an appropriate passage to use for risk-taking trespass actions at Shoalwater Bay, to expose and discuss the military response to fear, and the Christian alternative. Those going into the live fire zones/exercise area risk life and limb, but do not threaten any other person. We respect the soldiers, and challenge the politicians who abuse them. 4/ ANZAC DAY WHITE POPPIES I’ve got a box of 100 white poppies, and supporting material, from the Peace Pledge Union. They’ve been using White Poppies for the British Remembrance Day. Graham wants to do workshops where communities make their own white poppies. The white flower material is fabric, and consists of two pieces exactly the same (four petals), offset 45%, with a green circle centre saying PEACE. I’d like to explore how they might best be manufactured/assembled easily in small groups – in sufficient numbers that we might get 10,000 of them in the first year. If you’d like an actual physical white poppy to think about and plan around, e-mail me with a postal address. I’ll send you one. 5/ NEW ZEALAND/AOTEAROA I’m sending this to friends and colleagues in New Zealand, as well as Australia, and asking them to think about how we strengthen our cooperation in relation to both ANZAC Day and TS11. I was introduced to the White Poppy by Edwina Hughes of Peace Movement Aotearoa. So we can now use the White Poppy as ANZAC Peacemakers, and coordinate action and public relations. 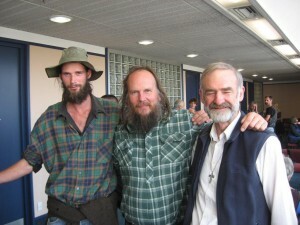 Of course my main purpose in New Zealand was supporting the Waihopai Ploughshares (Adi Leason, Peter Murnane, Sam Land) who were acquitted at their trial 8 – 17 March 2010. What kinds of solidarity and educational events you might like to organise in your home town, as ANZAC Peacemakers, around Talisman Sabre and the US military doctrine for the western Pacific region. So this is what people do when they are serious about changing the world.